For some reason, I'd been thinking about the Butternut Squash Caramelized Onion Pizza I made last year. Maybe since I'm starting to see winter squash on sale again, I wanted something a bit similar. However, I didn't quite have enough cheese for a pizza, and galettes just seem more fun! They've got the whole rustic elegance down. Plus, I get to use my cast iron skillet. :) The cast iron skillet certainly isn't a necessity. 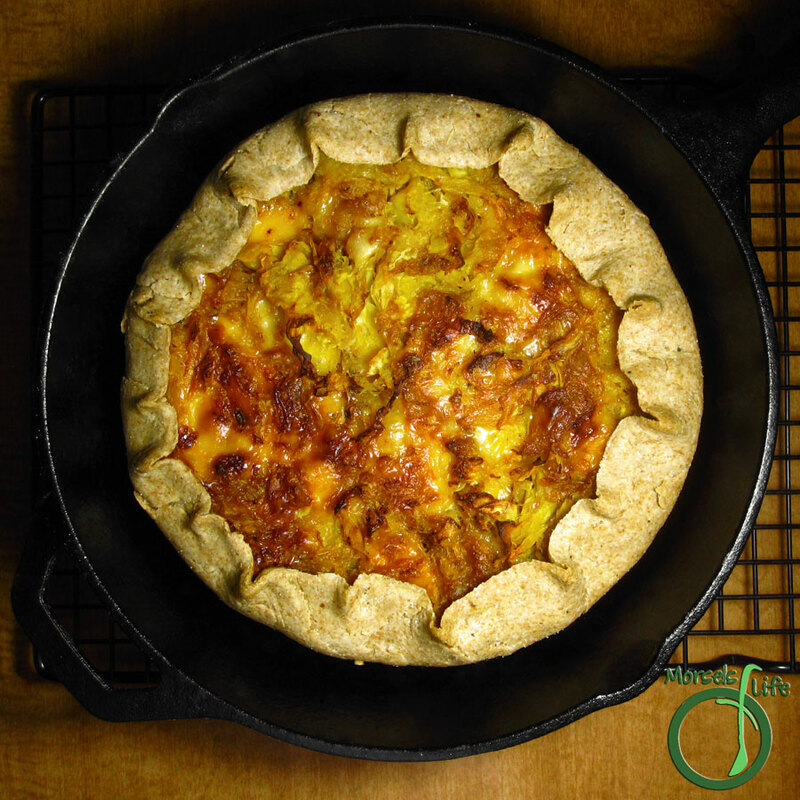 You can easily use just a baking tray, pie tin, or even a pizza stone. I just feel like I don't use the cast iron skillet enough, so I like using it when i can. Do you have a pot or pan you don't feel like you use enough? Which one? 6-8 ounces cheese, shredded I used 2 ounces each of Monterey Jack and cheddar and 4 ounces Parmesan. Place butternut squash on a baking tray and spray with a bit of oil, then roast at 400F while preparing crust. You want it to cook a bit, but don't be too concerned if it doesn't cook completely. Roll out crust, and place it in a cast iron skillet (or baking tray) with a bit of corn meal sprinkled on it to prevent sticking. Mix all remaining materials with butternut squash, and spread filling in crust, leaving a border. Fold the border over the filling, folding/pinching where needed. Bake galette for about 45 minutes at 400F or until browned on top. This looks SO good! I love butternut squash! Thanks for linking up with "Try a New Recipe Tuesday!" :-) I hope you will join us again this week! Thanks for linking up to last week's Tasty Thursday! Hi there. The current Food on Friday is all about onions! So it would be great if you linked this in. Wishing you very happy Holidays! thank you for linking this in to Food on Friday. We are now starting to get quite a collection of onion dishes together. Do stop by some of the other links to check them out! Happy Holidays! Mmmmm caramelized onions are a favorite of mine! Another keeper, CJ! Thank you for sharing your wonderful post at #WonderfulWednesday. I look forward to what you will share next week! Do something special. Give yourself a standing ovation today! We hope you’ll come back again next Sunday when we open our doors at 6:00 PM EST. Be kind to each other. “Like" someone in person today! Oh my - this is just incredible!! Had to pin it! Thanks for sharing on the What's for Dinner Link up!